The manuscript was sold by Bonhams as part of the collection of the poet and scholar Roy Davids: it had been given an estimated sale price of £40,000-£45,000, but went for more than double that, selling for £92,450. The Brontë poem, said the auction house, is "extremely rare", because although the author would go on to write around 200 poems, the "vast majority" are in institutions, with "perhaps no more than four" in private hands. "I've been wandering in the greenwoods" is a celebration of nature, with the precocious young poet elaborating on how she has "been to the distant mountain,/ To the silver singing rill/ By the crystal murmering mountain,/ And the shady verdant hill." 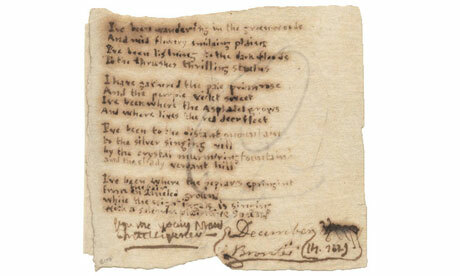 It appeared in a printed version in the literary magazine The Young Man's Intelligencer, which was produced by the Brontë children for their own enjoyment. Charlotte took over as editor from her brother Branwell in 1829." This auction follows the sale of one of the famous little books to the Musée des Lettres et Manuscrits in 2011.